Array. En fait, le livre a 156 pages. 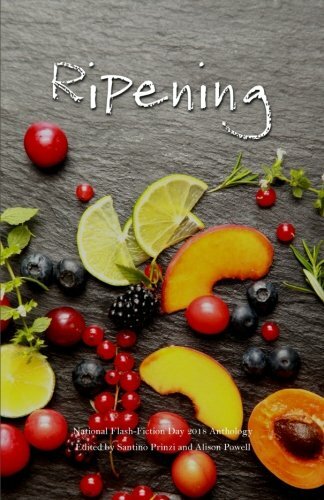 The Ripening: 2018 National Flash-Fiction Day Anthology est libéré par la fabrication de CreateSpace Independent Publishing Platform. Vous pouvez consulter en ligne avec Ripening: 2018 National Flash-Fiction Day Anthology étape facile. Toutefois, si vous désirez garder pour ordinateur portable, vous pouvez Ripening: 2018 National Flash-Fiction Day Anthology sauver maintenant. This seventh annual instalment of the National Flash-Fiction Day (UK) anthology is overflowing with food-themed flashes. Satiate your hunger for fiction with these delicious stories by new and established flash fiction writers. The authors have cooked up a smorgasbord of entertaining, moving and tantalising flashes for your reading delight. From fudge to oysters, apples to mangoes, gingerbread to (of course!) cake, there’s something in this anthology for everyone to sink their teeth into. Authors include: Alison Powell, A. E. Weisgerber, Abi Hynes, Alan Beard, Alicia Bakewell, Amanda O'Callaghan, Angela Readman, Anita Goveas, Anna Rymer, Anne Summerfield, Calum Kerr, Catherine Edmunds, Charlotte Wührer, Charmaine Wilkerson, Christopher Allen, Christopher M Drew, Claire Polders, Damhnait Monaghan, David Cook, Deborah Meltvedt, Diane Simmons, E. P. Chiew, Elaine Dillon, Emily Devane, Emma Harding, Erica Plouffe Lazure, Fiona J. Mackintosh, FJ Morris, Frankie McMillan, Gay Degani, Gemma Govier, H Anthony Hildebrand, Helen Rye, Ingrid Jendrzejewski, Ioanna Mavrou, J. E. Kennedy, Jacqueline Saville, Jan Kaneen, Jennifer Harvey, Joanna Campbell, Jude Higgins, Judy Darley, Kevlin Henney, KM Elkes, Kymm Coveny, Laura Pearson, Leonora Desar, Lisa Ferranti, Meg Pokrass, Megan Giddings, Nadia Stone, Nan Wigington, Nancy Stohlman, Nuala O'Connor, Olga Wojtas, Philip Charter, Poppy O'Neill, Rachael Dunlop, Rebecca Field, Robert Scotellaro, Ros Woolner, Sal Page, Santino Prinzi, Sara Chansarkar, Sarah Evans, Sharon Telfer, Sophie van Llewyn, Stephanie Hutton, Sylvia Petter, Tara Laskowski, Tim Stevenson, TM Upchurch. The editors are Santino Prinzi and Alison Powell.